2181 New Saar - nice mint never hinged collection in the lighthouse hingeless illustrated album. As well better issues including flood set, day of the horse 1949, official stamps series, peoples help 1949 / 51, postal stamps 1949 / 51 and so on. Favorable! 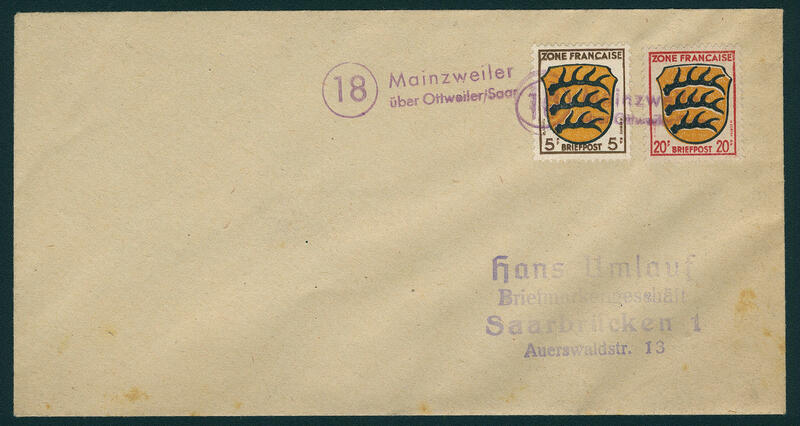 2227 / /⊙/∆ Saar - 1920 / 34, complete collection the old Saar issues in the Lindner T hingeless printed form ring binder with all good values and sets. 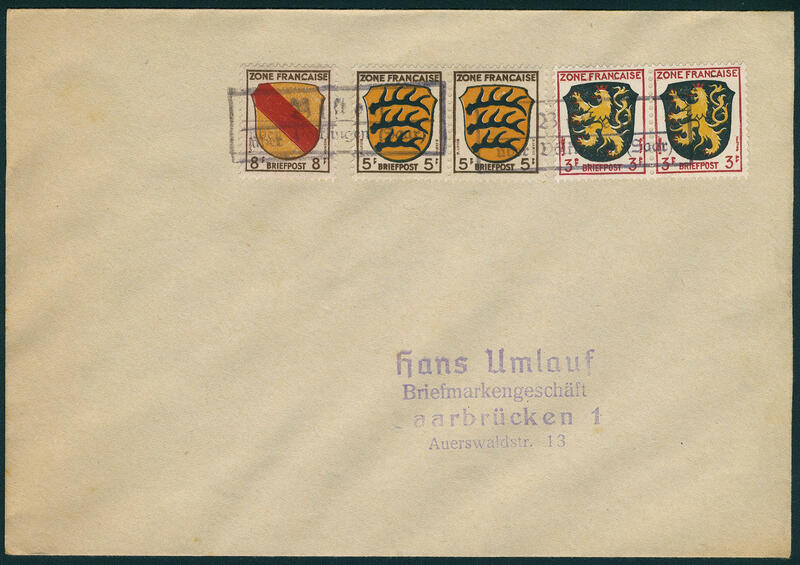 With also Sarre-Germania, Bavaria Sarre (top values expertized Burger BPP), as well landscape sets, all welfare sets, as well official stamps. A magnificent object! 2240 ✉ Saar / French zone - outstanding special collection from 180 covers and cards, partly addressless, in the ring binder. All with frankings French zone generally issue and cancellations from Saarland locations. As well enormously many scarce provisional cancel smallest places, the partly only in few copies existing. In this richness and variety hardly once again to gather! 2315 /⊙/ New Saar - nice collection, partly twice collected on stock pages, with also peoples help 1950 mint never hinged, peoples help 1951 mint never hinged, both Heuss sets mint never hinged and once again neat cancelled, as well numerous further issues. Favorable! 2338 x New Saar - interesting lot packed in a carton with issues on stock pages, album pages and so on, as well numerous better issues, an extensive part used sets including peoples help 1949 / 51, flood set, Day of the Postage Stamp 1950, Red Cross 1950, as well also numerous mint never hinged issues and so on. Very favorable valued! 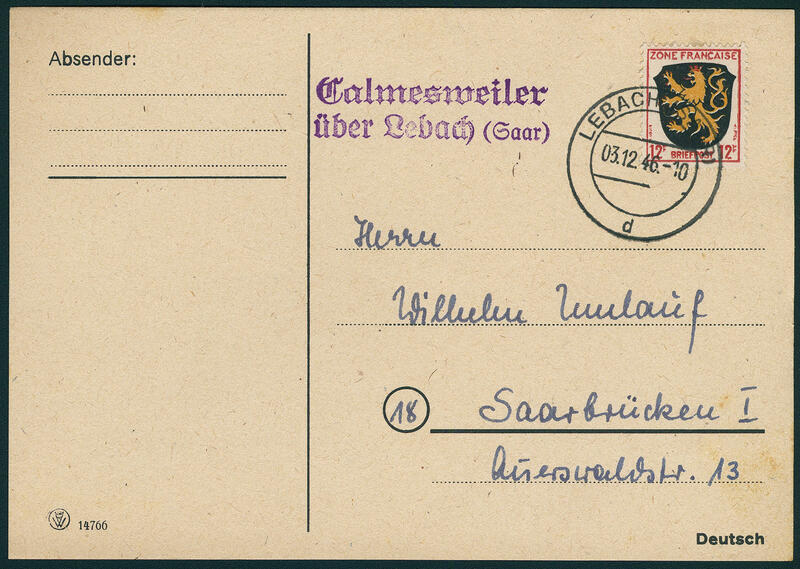 2340 ✉ New Saar - interesting lot of covers, cards and First Day Cover in the box. As well nice documents day of the horse 1949 on cover with first day special cancel, package card with 50 Fr. 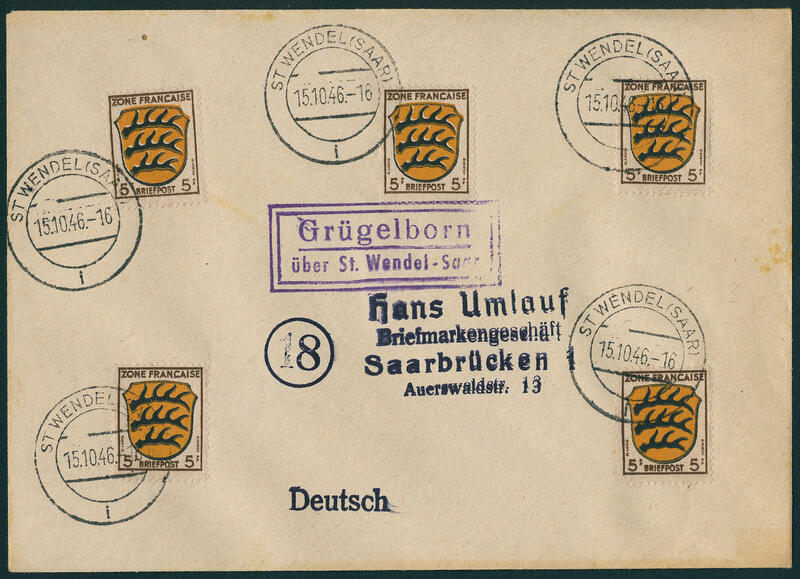 Airmail 1948 with additional franking, very nice multiple franking, Heuss II on very decorative registered covers and so on. A delightful lot! 2341 ✉ Old Saar - interesting inventory packed in a carton with attractive documents, interesting frankings, single- and multiple franking, different postage steps and use form, registered, interesting legitimate postage, nice documents referendum 1935 including top values and so on. A delightful lot! 2387 /⊙/ Old Saar - interesting lot on stock pages. As well overprint issues, landscape stamps including tête-bêches and top values, Volkshilfe values, referendum postage stamps set, airmail and so on. Favorable! 2388 /⊙/ New Saar - extensive lot on stock pages, as well a great many mint never hinged issues, better values and sets and so on. Including flood set, day of the horse 1949, Day of the Postage Stamp 1950 twice, Red Cross 1950 / 51 in both conditions, Council of Europe mint never hinged from corner margin, as well once again used, peoples help 1950 / 51, official stamps set in horizontal pairs mint never hinged and so on. Very favorable! 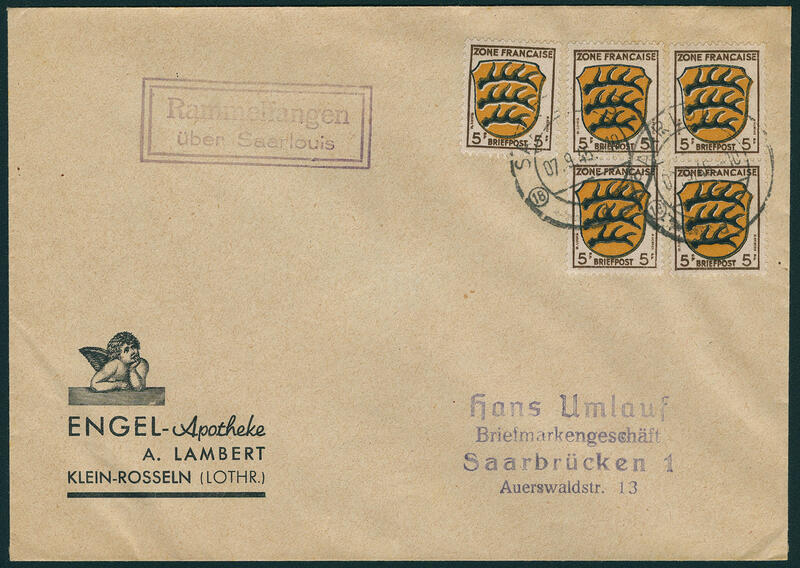 2440 ⊙ New Saar - extensive used collection in a large stockbook with useful issues, with also airmail 1948, youth hostel association with special cancel, flood set, day of the horse 1949, peoples help 1949 / 51, Kolping, Day of the Postage Stamp 1950, Red Cross 1950 / 51, Council of Europe expertized Ney, official stamps set and so on. Favorable valued! 2466 ⊙/✉ 206/25 New Saar - 1947 / 59, extensive used collection with numerous sought-after issues on KABE pages. With also Michel no. 206 / 25, 226 / 38, flood set, Day of the Postage Stamp 1951 on nice special card, Council of Europe, as well the 200 Fr. 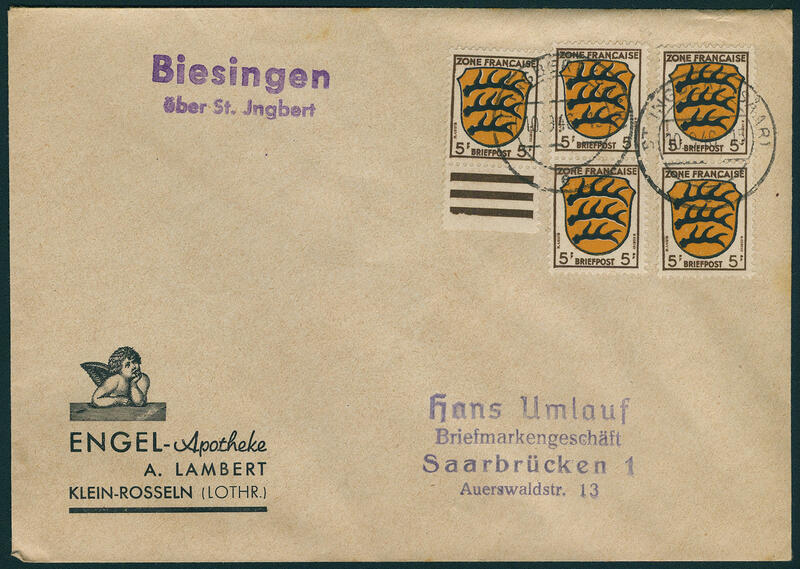 On registered air mail letter, Kolping from the corner of the sheet, peoples help 1951, both Heuss sets and further better issues. Favorable valued! 2545 x New Saar - interesting and extensive lot packed in a carton with numerous issues mounted on pages and stock cards. With also some welfare sets with useful issues, much used material, Day of the Postage Stamp 1950, Council of Europe and so on. Favorable valued treasure trove! 2610 / Old Saar - 1920 / 34, nice and rich collection with numerous Sarre-Germania, 5 Pfg. - 3 Mark Bavaria Sarre, all three landscape sets, peoples help 1926 / 27, peoples help 1929, both welfare sets from 1931, airmail 1932, 5 Fr. Castle peoples help 1932, Neunkirchen set 1933, peoples help voting postage stamps set, official stamps and so on. A magnificent object! 2692 ⊙ New Saar - 1947 / 59, extensive used collection on Schaubek preprinted pages. 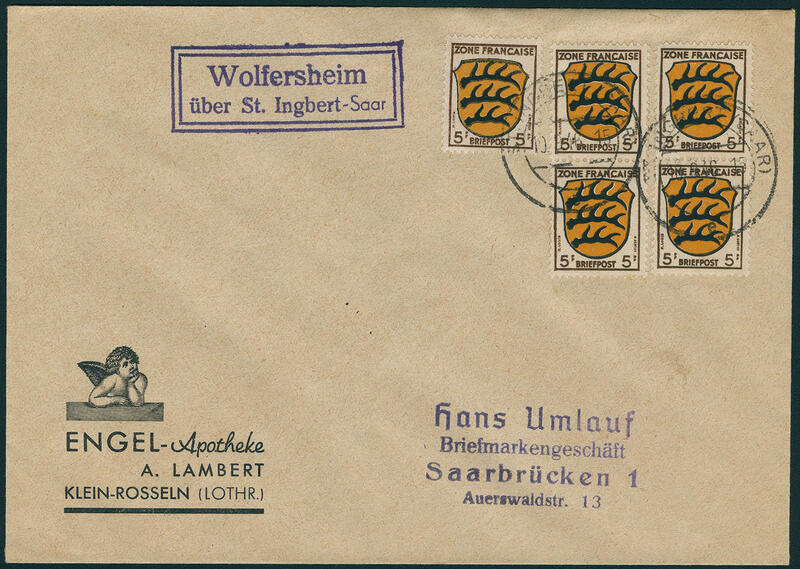 As well numerous better issues as for instance peoples help 1949 centric cancellation \"HOMBURG\", Council of Europe 1950, Day of the Postage Stamp 1950, peoples help 1950 / 51, both Heuss sets and further better issues. Superb collection, favorable! 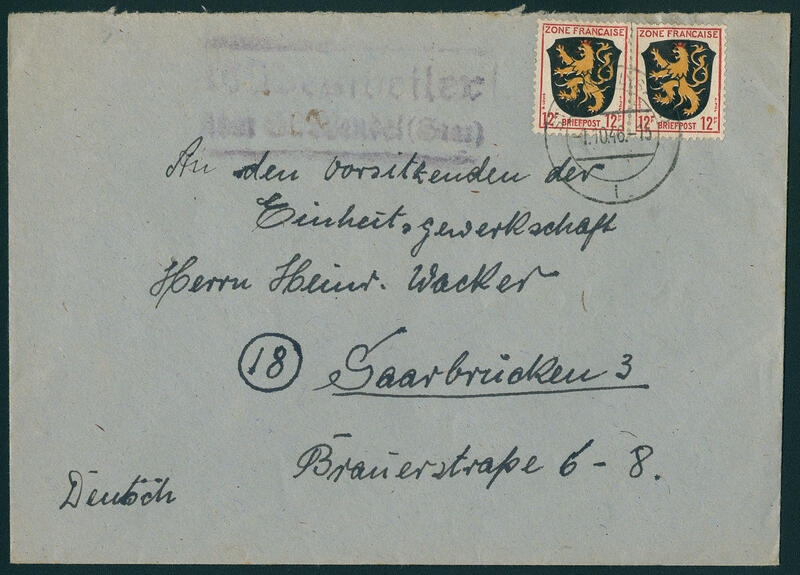 2693 x New Saar - extensive lot packed in a carton, with also the large flood souvenir sheet, numerous further issues mounted on pages including complete sets, peoples help issues, Heuss sets and so on. Favorable treasure trove! 2726 /⊙/ 18/31 Saar - interesting inventory from only old Saar issues in the spring back binder with lots of better values. As well extensive special part Sarre-Germania with different types, colors, shades and so on. Including the 80 Pfg., partly expertized Burger BPP, the good set Bavaria Sarre (Michel no. 18 / 31) mint never hinged / unused, as well 5 Mk. Expertized Burger BPP, numerous official stamps with plate flaws / overprint errors and so on. Favorable! 2757 /⊙/ Saar - extensive inventory former and New Saar in a large thick stockbook accommodated, partly close one above the other puted with lots of material, especially New Saar very extensive equipped, as well a great many mint never hinged issues, also blocks of four, sheet numbers, numerous complete sets as for instance flood set twice, peoples help 1949, Red Cross 1950 in the margin pair, peoples help 1950, peoples help 1951 and enormously many further issues, numerous margin copies, corners of the sheet, official stamps and so on. Enormous catalog value!